Homemade granola is so much better than the variety in the store and so easy to make. Granola makes a great snack (even kids like it) or breakfast cereal. Plus it tends to be on the healthy side with oats and nuts and naturally sweetened with dried fruit, honey and maple syrup. Good stuff to keep on hand in the pantry. Preheat oven to 350°. Line 2 baking sheets with parchment paper or aluminum foil. In a large bowl, combine the oats, sunflower seeds, chopped nuts, salt, and cinnamon. In another bowl, whisk together the Canola oil, maple syrup, honey and vanilla. With a wooden spoon, stir the wet ingredients into the dry until all the oats appear wet. Place half of the mixture onto each baking sheet and spread flat into one even layer. Place pans into the oven. Bake for approximately 20-25 minutes until lightly golden brown. Stir the granola about halfway through baking and turn pans to achieve a more even color. Don't overcook or the granola will have a burnt taste. Remove from oven and let the granola cool on the pans. When room temperature, place the granola in a large bowl. 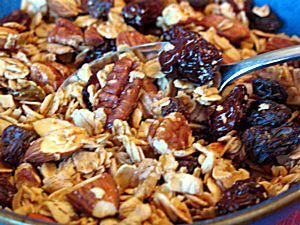 Mix in the dried fruit with a wooden spoon breaking up any large pieces of granola. Store granola in an airtight container at room temperature or in the freezer. Do not place in refrigerator or it will become sticky.